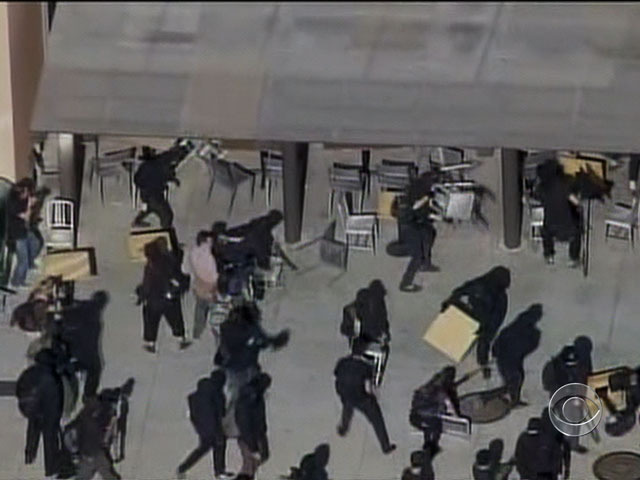 Is "Black Bloc" hijacking Occupy Oakland? Peaceful protests by the Occupy Oakland movement were overshadowed this week by violent clashes between a small group of demonstrators and police. Now there's concern among the majority of protesters that their message is being hijacked. CBS News correspondent John Blackstone looks into this latest development. It could be seen as a battle for the image of the Occupy movement. One demonstrator struggles to put out the flames of a burning barricade as others masked and dressed in black pull him away. It wasn't the only time during a huge Occupy demonstration in Oakland this week that protesters found themselves on opposite sides. When dozens of black clad marchers began attacking a supermarket, others urged them to stop -- finally linking arms to protect the store from further destruction. One demonstrator, Sheik Anderson, distanced most of the protesters from the violence. "We called the mayor's office the moment we understood what was going on over there," said Anderson. "That was an anonymous action, that was nothing to do with Occupy Oakland. To many demonstrators, a sinister mask, fashioned on Guy Fawkes, the revolutionary who attempted to blow up the British Parliament buildings more than 400 years ago, has become a worldwide symbol of anarchy and revolution. "I see Black Bloc as a tactic, not really as a movement," said Ryan Andreola, an Occupy demonstrator. He said he believes in non-violence but is not ready to condemn the tactics of the Black Bloc. "As individuals," said Andreola, "we respect people's freedom to act they way that they feel they have to act to make the changes they wish to see." Those intent on violence may be on the fringes, but once the trouble begins, they often get the spotlight. In Oakland, city officials have warned that more violence could bring another order to close down the Occupy encampment.